The upper bank zone is on higher ground but may still be partially flooded every couple of years. 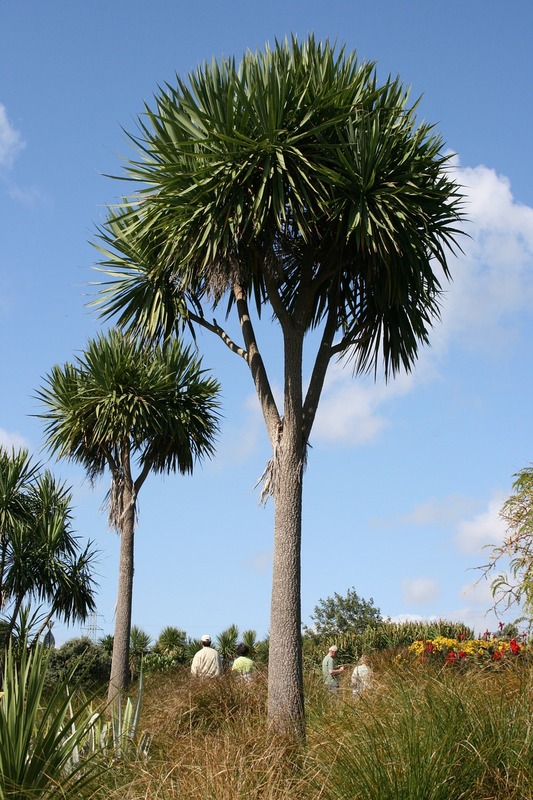 Dairy NZ suggests using flaxes, grasses, shrubs or trees which provide shade and shelter. New Zealand summers would not be the same without picnics and swimming at our pristine rivers. But, future generations may miss out on these experiences due to the freshwater crisis that New Zealand ecosystems face today. Land use associated with dairy farming affects local ecosystems and is linked to the reduction of the quality of our waterways. Did you know that 44% of all monitored lakes are polluted beyond the point of eutrophication, and 62% of our lowland rivers have more pathogens than are safe to swim in. But, there are planting strategies you can implement on your property to protect the environment around you. Riparian management allows for the everyday runoff from the agriculture industry in a way that keeps your production on target but reduces damage to your waterway. This post will show you how to implement riparian planting and how to manage it effectively. Before we look at how to make the most of riparian planting techniques, let’s take a look at what it actually is. The word ‘Riparian’ comes from the latin ‘Ripa’ meaning, river bank. The Riparian Zone refers to land beside a stream or river and is where this post will be focussed. Quick definition: Riparian management aims to reverse the impacts of land use by filtering out contaminants before they are able to reach the stream. Replanting trees restores environmental functions provided by trees such as shade and bank stability. Improving the attractiveness of your property. Plants act like a sieve, filtering out sediment and nutrients before they reach the stream water. Trees stabilise the banks, prevent the erosion of soil and improve the habitat for local wildlife. Once you have decided where to build your fence, the next step is deciding what to plant and at what spacing. 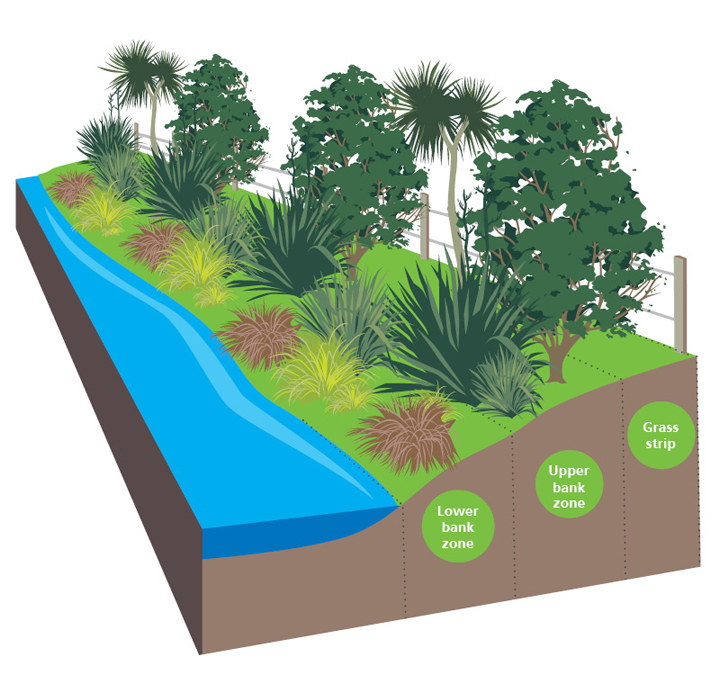 According to Dairy NZ, in the riparian margin between the waterway and fence, there can be up to three zones where planting is useful. Tip: Planting the upper and lower banks will improve water quality more than using a grass strip alone. Look for your your region’s riparian guide to view the table of riparian plants best suited to your region. The lower bank zone is prone to flooding so plants need to be tolerant of waterlogging. Dairy NZ suggest using plants such as sedges and rushes, which are well rooted and can survive many days under water. Dairy NZ suggests that a grass strip at least one metre wide should be always be left between all fences and waterways to “help filter sediment, phosphorus and faecal bacteria from runoff before it reaches the water.” This grass strip also prevents plants from tripping electric wires or being grazed if the lower banks are going to be planted. You can find more information on what to plant and where at the Dairy NZ website. Time: . You will need to be patient. What has been done to your waterway over a long period of time cannot be undone quickly. It won’t happen overnight. Proximity: What are the farmers upstream doing? This will have a huge impact on what happens in your local waterway. Consider speaking to neighbouring properties about ways you can collectively manage your local ecosystem. Weeds: To sustain itself over the long term, the plantings must out-compete any weeds. Plants must form a closed canopy that shades the ground. This will reduce and prevent weed dominance, creating conditions that favour the establishment of new seedlings. Riparian management can improve both water quality and the habitat for local life. The key to achieving this lies in consistency along the waterway to be sure there is no further contamination across regions, patience to carry on the project over time and careful weed management. With these considerations and continued assessment, your local ecosystem can only benefit.